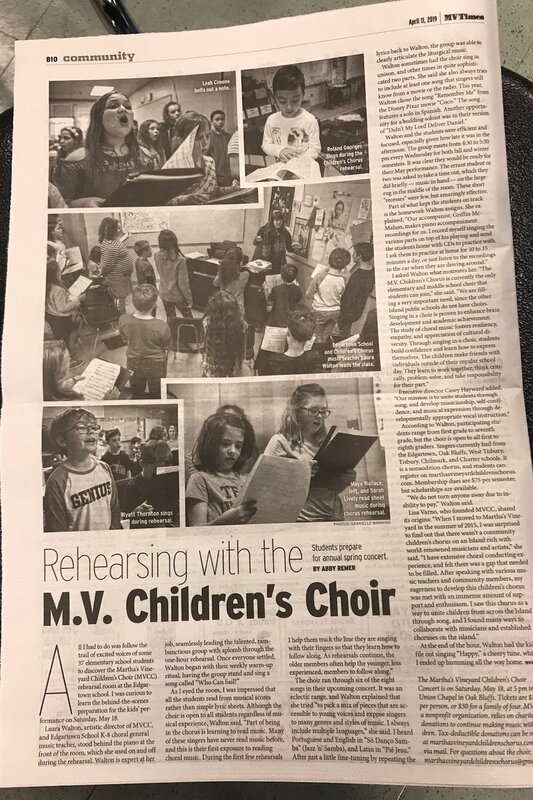 In the News — Martha's Vineyard Children's Chorus, Inc.
MV Children's Chorus Featured in MV Times! Many thanks to Abby Remer and Gabrielle Mannino at the MV Times for this wonderful article about us. Copy and paste the link below into your web browser to read the full article and see many wonderful photos! Martha's Vineyard Children's Chorus Receives Permanent Endowment Grant. The MV Children’s Chorus was generously awarded $2,500 by the Permanent Endowment for Martha’s Vineyard. This funding will help our organization continue to grow, and serve young musicians on the island. Artistic Director Laura Walton spoke on behalf of the organization, detailing the positive impact we have on island children and their families. Many thanks to the Permanent Endowment for this needed support! The Martha's Vineyard Children's Chorus was generously awarded a $1,000 grant from the Cape Cod Five Foundation, in support of our goal to provide choral music education to all children. Pictured left to right are Laura Walton, Artistic Director and Edgartown Elementary School Music Teacher, Richard Leonard, Regional President-Martha’s Vineyard for Cape Cod 5, and Casey Hayward, Executive Director and 5/6 Teacher at M V Public Charter School. Many thanks to Richard Leonard and the Cape Cod Foundation for providing us with this needed funding! I have some important news to share, which leaves me with mixed emotions. I recently accepted a job offer at the Hopkins Center for the Arts at Dartmouth College. While I am very excited about this opportunity, it is very difficult for me to peel away from working with these amazing singers and collaborating with the many fine musicians and directors on this island. Due to this news, we will be shifting roles and responsibilities this next semester. At the start of this next semester in January, Laura Walton, music teacher at the Edgartown School, will serve as our Artistic Director, while Casey Hayward, teacher at the Charter School will serve as our Executive Director. You can find out more about our directors below. Our students have loved working with Ms. Walton as she has been assisting our rehearsals this fall! I will continue to stay connected to this wonderful organization as Founding Director, offering support to both Laura & Casey during this transition. You can expect to see me at concerts and for periodic visits to family and friends on the island. We look forward to another wonderful semester together in January! Rehearsal dates will be updated shortly and will be held on Wednesdays from 4:15-5:15 (Lyric) & 5:15-6:15 (Concert) at the Edgartown School Music Room. Casey Ann Hayward is an educator, director, writer and performer. Currently, she is teaching 5/6 grade science and social studies at the Martha’s Vineyard Public Charter School in addition to weekly offerings such as improvisation and debate and a two week intensive on music and songwriting. She was a panellist at NYU’s International Forum for Educational Theatre and has apprenticed for The New 42nd Street Studios/New Victory Theatre and The 2009 TONY awards. She trained professionally at The Lee Strasberg Theatre and Film Institute, Body in Space Theatre Company, and at The Yard for their “DEL Day of Dance Workshop for Island Educators.” She is an active member of Kappa Delta Pi International Honor Society in Education and has taught for The National Youth Drama School, The Martha’s Vineyard Playhouse, Barrow Street Nursery, The West Tisbury School, The Martha’s Vineyard Film Festival, and Education Unlimited at MIT. Publications include “How To Be An Actor” (New Chapter Press, 2013) and “Exoskeletons: Generating Content For Popular Music” The Teaching Artist Journal (Taylor & Francis, 2016). In 2017, she co-wrote, “Gene Play” with Jonah Lipsky; directed by Joann Green Breuer (Monday Night Special Series, MV Playhouse). Education: MA, New York University. BFA, Boston University. Laura Walton currently serves as the Edgartown School’s K-8 Choral/General Music Teacher and is excited to continue building this ensemble within our island community. Laura holds a Bachelor’s of Music in Music Education from Syracuse University Setnor School of Music and is pursuing a Master's Degree in Elementary General and Special Education at New York University. She has experience working in a variety of educational settings ranging from interning with the Syracuse Children’s Chorus under the direction of Marcia DeMartini, teaching early childhood music classes, and tutoring academic and literacy skills to various ages; her students have ranged as young as early childhood through high school. Laura believes all children have strengths, whether they be musical or otherwise, and that the job of a teacher is to find those strengths and foster them to their fullest potential. I am so proud of this amazing group of singers and it has been a joy to observe their continued growth! I am indebted to you, parents, for all of your support; our fabulous singers for their energy, enthusiasm, and dedication; our wonderful accompanist Griffin; Jan Wightman, Abigail Chandler, Peter Boak & the Island Community Chorus, Carolee Stewart, Kevin Ryan, Emily Anderson for your openness to collaborate and support our growing organization; and to our strong island community for welcoming us with open arms. Have a wonderful holiday season, and we look forward to celebrating the beginning of our third year with you in January! 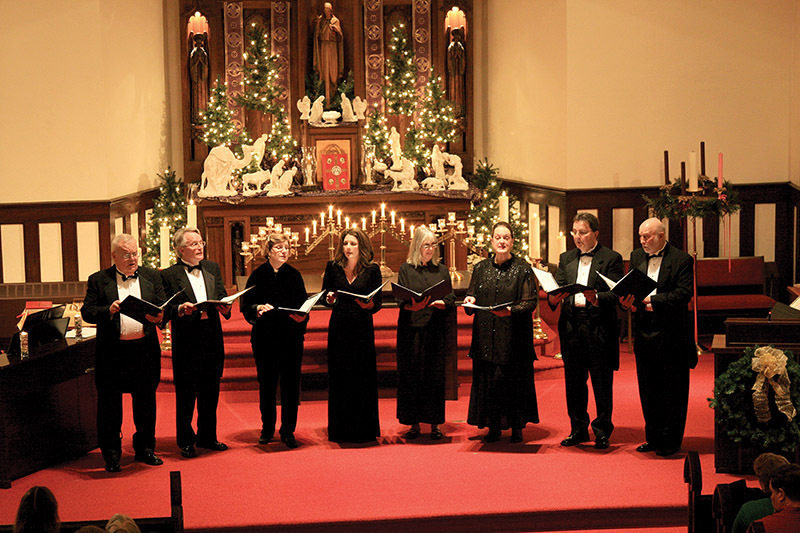 We were fortunate to perform at the 21st Annual Hospice Benefit Concert at the Whaling Church in Edgartown. Thanks to Kevin Ryan for inviting us to sing and to the Novem Octet for collaborating with us! What a beautiful experience, enjoyed by all. Check out this interview with director, Lisa Varno, as she discusses updates to the Children's Chorus! Thanks to Laurel Redington Whitaker for this wonderful exposure. Click here to read a great article about our spring concert! Thanks to Sophia McCarron for taking the time to visit us.